You should check your credit reports and credit score every year. This is just good ‘ole general information. Luckily, I can teach you how to check your credit reports and credit score. By checking your reports, you will be able to identify 1) inaccurate information, 2) fraudulent information and 3) take financial inventory of accounts you have open. By getting your credit score, you will know what lenders are looking at in order to determine your creditworthiness. There are three main reporting agencies that you can get your credit reports from: 1) Experian, 2) Equifax, and 3) TransUnion. Federal law states that you can get your reports once a year for free. You can get all three at once, or spread it out and get one every four months – it’s up to you. Some people prefer to get them all at once because it’s easier to remember once a year than it is to remember to do it throughout the year. The advantage to doing it throughout the year is that you’ll catch something that’s wrong more quickly if you are looking at a report every four months (verses every twelve). To start the process of getting your reports, go to annualcreditreport.com. 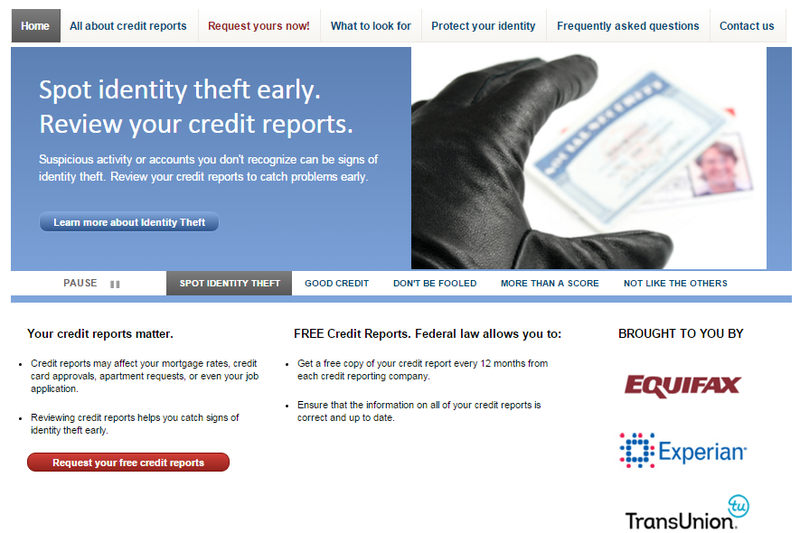 This is the one website where you can actually get your credit reports online for free is annualcreditreport.com. So, this is where you want to get your reports every year. 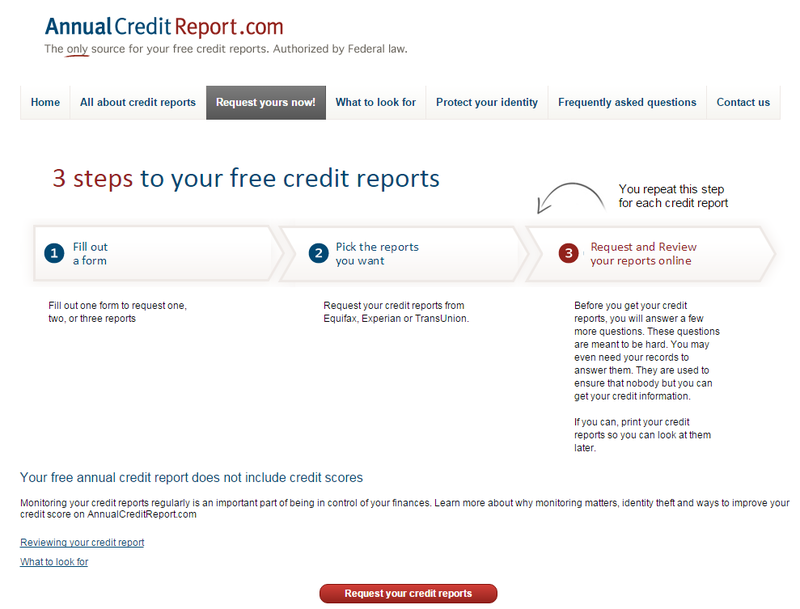 Click on “request your free credit reports” in the lower left part of your screen — the button is red. You’ll be prompted with three steps to apply for your reports. 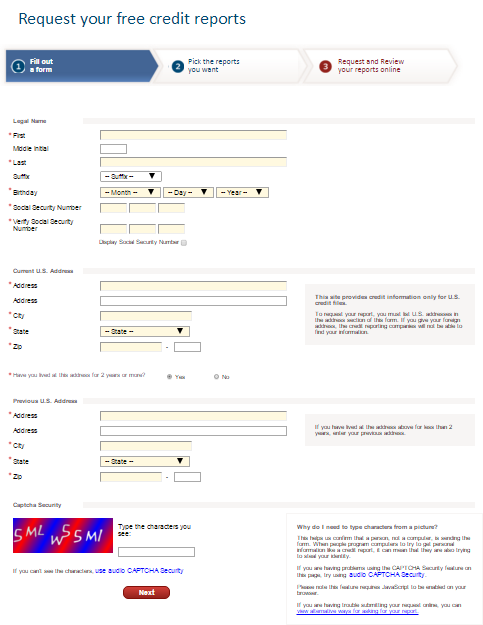 First, you need to fill out a form with your personal information. Fill out the form with accurate information. If you make mistakes, it’s harder to get your reports online. So, be sure to provide the right info. Choose which report you’re getting. Start with one and go through the entire process. You’ll repeat it now or in a few months for the other reports, depending on when you’re choosing to get them. At this point, you may get your credit report immediately. Or, you may have to fill out additional information to prove your identity. If you are prompted with the latter, fill out the additional steps to verify who you are, then you should receive your credit report. Once you’ve completed the steps for one report, go back through and complete the steps for the remaining reports. Do this if you are getting all three reports at once. If you’re doing it every few months, then come back and follow the same process for the other reports in a few months. After this step, you have everything you need for your credit reports. Save the documents and print them out for your records. Credit scores are based off information from your credit reports. You actually have more than one credit score. Your FICO score is one of the most popular scores used to determine creditworthiness, but there are lots of other credit scores that you have. For example, a lender could use your VantageScore, which is a score created by all three credit agencies. If this happens, knowing your FICO score wouldn’t be of much use. However, different scoring models typically place you in the same credit range 73%-80% of the time, according to the Consumer Financial Protection Bureau. This means if you pay for your FICO score and you’re in the “Fair” range, you’re most likely going to be in that range for other scores. There’s no Federal law that says you get your credit score for free once a year, so unfortunately, you will probably have to pay for it. You can order your FICO credit score from myfico.com. When you order your score, be aware that there are a lot of options for you to signup for credit monitoring and to pay for your credit reports. You do not have to order any of these products. You can just order your credit score. 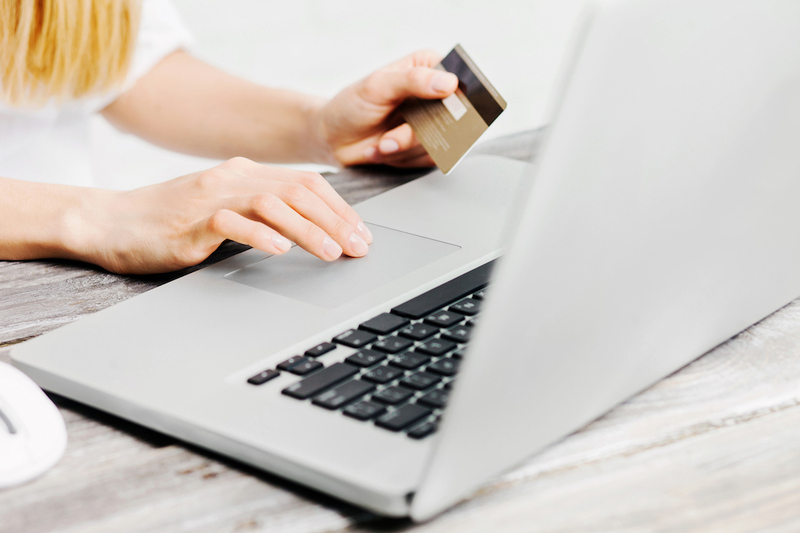 You can also order a credit score from any of the three reporting agencies. Usually pricing is anywhere from $15-$25 for your credit score. Remember that your credit score is a number based on the information taken from your credit reports. Thus, it’s very important for you to order your credit reports and review them annually. Once you have your credit reports and your credit score, you need to review and evaluate them. When you look at your Credit Reports, pay attention to the following information. Personal Information. Analyze your name, address, phone number, social security number, and any other information personally identifiable to you. Look closely to make sure the information is correct. Public Records. There is a public records section on your credit report that will have any bankruptcies, law suits, or tax judgements listed. Analyze this information to make sure it’s correct. Credit Accounts. All of your debts will be listed in this section. Your payment history will be listed for each open account. You will also see this information for closed accounts for seven years. Make sure this information is correct. Inquiries. This section shows when a lender checks your credit. Make sure you pay attention to the details on your credit reports. If you have any information missing or that is incorrect, you need to report it. Even more important is if you think you have had your identity stolen or see fraudulent information on your reports. While these numbers vary slightly, in general, you can use the following information below to determine what your FICO score means to a lender. It’s important to get your credit reports from all three reporting agencies (Experian, Equifax, and TransUnion) at least once a year. You can do this for free at annualcreditreport.com. If you want to get your credit score, you will have to pay for it. Remember that you have lots of credit scores, even though the FICO score is the most widely used (you can buy this at myfico.com). This is one area that I have been incredibly lazy. I check my credit score using my credit cards – many of them offer free credit scores (I think they update them monthly), so as long as mine is high I’m less motivated to actually pull my credit reports. But it’s something I need to add to my annual December review, and you’ve created a wonderful resource here! I never feel like those are as accurate as going through the agencies, so I will go through and check them every year. It seems like more companies offer it now, though..
Yeah virtually every credit card seems to offer it now. I agree, though, that it’s better to actually get a copy of it from the agencies and make sure they are accurate. DC @ Young Adult Money recently posted…Is Rent Really Throwing Money Away? Yea, as long as you’re doing something that’s better than doing nothing! I haven’t checked my credit reports for the last 4 months. I think it’s time that I do this by using your steps Natalie. Thanks for the reminder. Great post on credit reports. And nice reminder for me to check on them too for both my hubby and I! I am curious as to your thoughts on how to improve a credit score. Mine isn’t bad but it’s not great either. Because I still have a high amount of student loan debt, that keeps the score from being great. I also have no other records of paying off debt – I live with my parents (I had an apartment in college, but it was under a friend’s name), I’ve never had a credit card, and I’ve never had a car payment. I want to improve my credit score, but I don’t want to take on any more debt! Interesting you say your student loans keep your score from being great. Maybe it will improve as you pay them off? My score is great, and it’s actually decreasing a bit because I’m paying SO much of my debt off and years are passing without me getting into more debt. I would check your score in one year – I would guess it would be better. Once you’re debt free, you can do other things to get your score to improve (which I’m sure you know), but I think it would be hard right now given your commitment to getting out of debt, which I think is totally worth it. Email me if you want to chat more about this! I think you are right – I’ve only paid off about $15,000 of my own debt so far (the rest is my husband’s). I still have $60,000 left on my own loans, so I’ve only paid off a small portion so far. I bet that as I pay more, my credit score will start improving. Hopefully once my student loans are 100% paid off, my credit score will be great. Absolutely agree that checking credit reports is vital! I definitely prefer spreading it out to give me more of a chance to catch fraud. Regarding credit score however, IMO, I don’t think you should ever pay for it. For one, just by using Mint, you get a periodic score update. Not entirely sure if this is an actual score or an estimate, but either way, it gives you a good enough idea. Several credit cards also give their card holders periodic updates as well. Even without these, as long as you have a clean credit report, you really don’t have to worry about your score. Thanks for a good reminder to check reports tho! I’m overdue to do it. Should really schedule reminders on my calendar. Just be clear that if you want your FICO score you have to pay for it. While there are lots of free (sometimes called FACO) scores, they’re all different. For me, the $8 is worth it.